Television is a media where children can see anything and everything. From cartoons to violence. And from friendship to bullying. Here are a few examples of where cyberbullying specifically had a staring role on the television. How do you know when cyberbullying has become a serious mainstream issue for many of America’s teens? When the conservative ABC Family channel on basic cable does a movie about it! The made for TV movie simply titled “Cyberbully” offered a small peek for parents into a world where their sweet children may be hurling or receiving dirty-mouthed insults at one another online, for “fun.” The ABC movie insults like “dogface” and “lardo” were tame compared to the real "choice phrases" of many teens online today. However, the lead character’s raw emotional responses to the insults she read being posted about herself online, the shattering of her good reputation, and the feeling that everyone was constantly talking about her were “spot on” representations for how cyberbullying makes teens feel. A major focus of the movie is the struggle Taylor and her newly divorced mother go through about whether she should have a social networking account, how much time she spends on it, and controlling the inappropriate comments she makes to other teens on it. The actions of the mother in the movie vary between over regulating and even banning her daughter from using her social networking account to ignoring the signs that there was a serious cyberbullying problem that ultimately led to her daughter attempting to commit suicide. Parents in America can really relate to the serious breakdown in communication that occurs between the mother and daughter over the course of the movie. Parents must walk this fine line between instructing their teen to behave appropriately online paired with trusting that they will come to you if they are being cyberbullied versus over regulating their teen’s online life which results in a communication breakdown. In the movie, each attempt by Taylor’s mom to regulate her daughter’s online life by taking away her lap top and demanding that she shut down her social networking account resulted in her daughter’s behavior becoming more secretive and her feeling more helpless against the cyberbullies. The movie becomes more instructive for the audience when Taylor attends a support group for other teens who have been cyberbullied. In one group session she finds out that she is not alone when two other teens share stories of being tormented online for their weight and their sexual orientation (see diversity). The therapist in the movie shares with Taylor the same advice that experts on this issue and our website suggest if you are being cyberbullied. Save and print out threatening conversations for documentation, block the bully, and then tell a trusted adult about the situation. 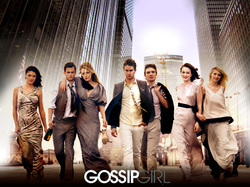 Gossip Girl is a show that airs on the CW and will begin its 5th season this fall. The show is narrated by an anonymous blogger, Gossip Girl, whose identity is never revealed. Gossip Girl is an all-knowing entity of the elite young of the Upper East Side in New York who have more money than they know what to do with. Gossip Girl has a wide audience who is subscribed to her texts, emails, and videos of juicy gossip on this elite set of teenagers. If you have dirt on your friend, your enemy, or your "frienemy" you send to to Gossip Girl who then forwards it to everyone on her subscription list. One sends dirt to Gossip Girl to rise the social ladder or to manipulate someone into doing something they want. You can imagine how the ever-present threat of Gossip Girl airing your dirtiest secrets affects the characters and their relationships. This show does a good job portraying how easy it is to tell someone's secrets to a complete stranger who then turns around and tells everyone else-- or at least, everyone who is relevant. Gossip Girl also demonstrates the fact that it takes less courage to bully someone through technology than it does to do so in person, even though you see the occasional face-to-face bullying that most people are familiar with. This show may not necessarily be completely realistic but it depicts the traditional hierarchy of high schools that drama shows love to portray. The technology is also used to 'bash' on one character, Dan, and his family who are from Brooklyn instead of the Upper East Side of Manhattan like the rest of the student body. Gossip Girl also shows best friends betraying and turning on each other by outing their secrets to Gossip Girl. This is reflective of younger students today who bash their friends and/or start rumors online to make themselves feel better or to manipulate their victim. This show could be used to show how quick and easy it can be to ruin someone's life. A limitation could be that Gossip Girl's audience will see the glory of climbing the social ladder, regardless of the costs. Law and Order: Special Victims Unit is a show on NBC that shows stories ripped from the headlines. These stories focus on sexually based offenses. The cases usually deal with younger adults and children being abused. Law and Order: Special Victims Unit did an episode that aired in November of 2008 called "Babes." In this episode, four girls go into a pregnancy pact. But when one of them kills herself, the detectives find out the girl was pushed to suicide by a bully online who is a classmate's mother. The online bullying caused this girl so much stress and upset her to the point in which she was convinced she had to kill herself in order to end her suffering. This character's "solution" is suicide which many other individuals who are bullied decide to use as well. This online based bullying or cyberbullying case shows the detrimental effects of cyberbullying not only on the student but also how it affects the family members. It also depicts a mother of another student using the internet to cyberbully the girl who chooses suicide. This shows that cyberbullying is not specific to teenagers, but can be between adults and children. This episode is a great example of the negative effects of cyberbullying and how one adult's actions can affect a teenage girl's life.